The Glorioso is reunited with the victory after a draw in Girona and three consecutive defeats with Getafe, Rayo and Madrid. The Levant, under the effects of the 'Toño case'. 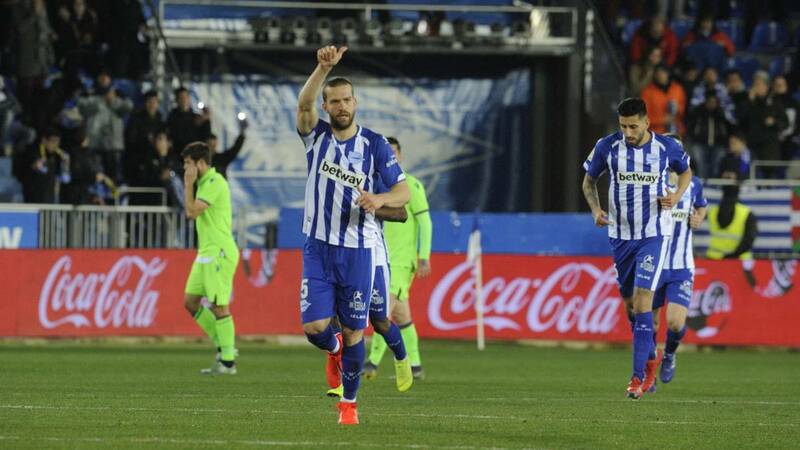 Alavés was reunited with the victory, returned to European positions and scared the ghosts after a draw in Girona and three consecutive defeats with Getafe, Rayo and Real Madrid. Levante, restless as it is with the Toño case, got confused in a corner and received the second goal in an unforgivable decision by Doukuré. Abelardo recovered his deep bands, with Jony at full capacity after his ankle injury and with the emergence of Inui, who was constantly changing sides with the Spaniard. He decided that and the effectiveness of an Imperial defense Laguardia and author of the 1-0 lead in the 24th minute. Levante was planted in Mendizorroza with casualties and the emotional blow for the Toño case. The left-back continues to be held in a prison in Teruel. They are things that are talked about in a dressing room and end up weighing on the performance of the group. With the backdrop of the protest of the stands against football on Monday and Friday, the shock started something cold. But in the 16 ', Calleri and Inui already warned in a double auction. Seeing the Japanese in that play clearly demonstrates that it works much better with the right leg than with the left one. Twenty minutes later, the Argentine tip could make the 0-2 after a gross error of Aitor. Already from the 24 the Abelardo team dominated after a corner kicked masterfully by Jony and finished off with a forceful head with Laguardia. El Levante, who had threatened with a 3-5-2 ended up playing with the classic 4- 4-2. And the truth is that the second half started better. A bad start by Pacheco in the 63rd minute brought fear to the stands. Jason, Moses, Roger and Morales were really activated and created danger. The fouls and corners thrown by Bardhi also disturbed the local defense. He has a glove on his foot. The entrance of Dwamena caused Levante to stay behind three behind. The match seemed decanted, and Doukouré made a poor pass control of Aitor and stole the portfolio an inspired Jony to make the 2-0. The coach of Deportivo Alavés, Abelardo Fernández, acknowledged that His team made "a very complete game" in the 2-0 victory against Levante. The Spaniard explained in the press room that they have been "very well in general terms with a fabulous first half" in which Levante did not create danger. "We played well in the second plays and very well defensively" , said the Babazorro coach, who considered the result of the first part "short". He considered that the result is "important because it cuts a streak of four games without winning" and because they outnumber a "direct rival" who also win in the "golaverage" . "Nobody could think to have the goal so close in the 23 ", insisted the gijonés, and valued the result even more because" there are teams that have negative streaks and anyone can beat anyone ". No wanted to highlight any player over others and valued the team's game In all its lines, from the goalkeeper to the forward. Sobre protests of the fans, said they respect their complaints about the schedules and stressed that "always" are with them, while incidió that is "incredible" as they push and they help them. Questioned by the Japanese Takashi Inui replied that "it is a player that gives us the closest thing" to what I gave them I Bai Gomez with his "verticality, pause, continuity in the game" and highlighted the changes of the band with Jony Rodríguez. "The team has shown to be brave until the last minute and we have played with a very intense pressure on their ball out ", celebrated. Paco López:" The team has competed, but I'm not satisfied "
El Levante coach, Paco López, recognized that his team competed against Alavés, but qualified that he is not" satisfied " by the defeat the team from Vitoria. El technician Granota commented that the idea was to play 4-4-2 for the players they had and noted that the team competed despite not throwing between the three clubs. "Overall it has been matched in a field that is not easy and the game has opted for a stopped ball, "analyzed the coach, who noted that" in the second half we have had dominance, but we lacked clarity in the last few meters to rear danger ". Recordó that they threw ten corners, but lamented not being successful because the opponent" defends well ". For Paco López el Alavés" is very competitive and does not need create chances to generate danger " and stressed that "set pieces is mand dangerous ", so it is not surprising" that it is one of the revelation teams ", although he considered that" everything is very compressed ". On Toño's imprisonment, he explained that he does not like to" justify nada "and stressed that they have to "unite more" . "This team, since last season, overcame a thousand and one adversities and we will not stop fighting and have faith," he concluded.